From one of the pioneers in strength training products, CAP Barbell introduces its latest strength training addition, the FM-CB8000F Deluxe Power Rack. CAP's FM-CB8000F Deluxe Power Rack is loaded with a number of comfort and safety features. The CAP FM-CB8000F main frame is constructed from a combination of 12 and 14 gauge steel. All tube seams are welded to provide additional strength and stability. 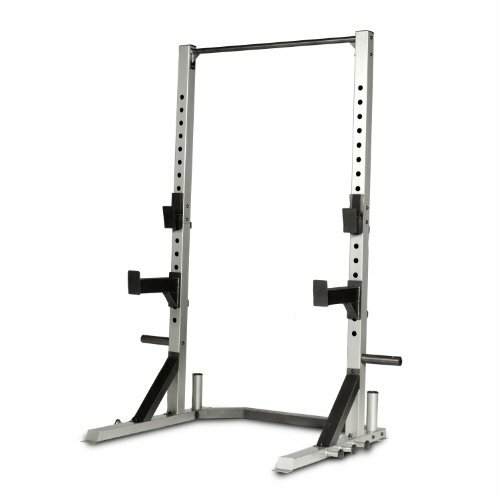 The overhead workout station is constructed from high grade tubular steel which is then fully welded to mounting plates with mini gussets for extra reinforced support. All open frame ends are capped for safety and to prevent inner oxidation. All steel components of this half cage are powder coated and sealed. Bar holders incorporate an ABS sleeve to prevent scratches while storing or removing a bar. There are also mounting tabs so you can mount the FM-CB8000F directly to the floor (hardware not included) for maximum stability and safety.